Marci Mazzarotto holds a PhD in Texts and Technology from the University of Central Florida. Her current research interests center on adapting avant-garde methods as a tool to foster student engagement and interdisciplinary thinking, while creating an arts-based experiential learning environment. Creatively, much of her work comprises of visual experiments utilizing video, photography, and paint, which are then compiled to create larger scale multimedia art installations. In the fall of 2018, Marci will join the faculty at Georgian Court University as an Assistant Professor of Digital Communication. This project began with a simple task: to free up memory on my smart phone. As I deleted the majority of images from my phone’s camera roll, I noticed that over a two-year period I had stored around 3000 images on the cloud (some of which had been previously removed). I was bit shocked by that number, as it translates to taking and/or storing about four images a day. While that daily number may not seem like a lot on the surface, it still made me question what and why I had saved so many images in a relatively short time span. I also wondered how many of those images had been shared on social media. This led me to start pondering other questions around the idea of just how often we photograph and for what purpose? Is there an awareness of the underlying intention(s) in our visual documentation? Or are we needlessly photographing the world because it is now so simple to do? Is our sharing of images tied to the desire for a more embodied experience in the digital world? Perhaps we seek instant validation? Or maybe we are suffering from an identity crisis? There is an (obvious) distinction between a physically-embodied experience and a virtually-mediated one, and photography can play a key role in how we define ourselves and interpret others on both sides of that spectrum. Our use and understanding of the apparatus itself (i.e. smart phone camera) has not only changed the way we capture the world, it has transformed how we communicate (i.e. composition of images) and the persistence of that communication (i.e. online sharing). In situating this idea within Gregory Ulmer’s work, electracy nurtures the importance of being literate in an electronically mediated environment and such a concept can apply to the composition, dissemination, and understanding of visual texts, as it does to written ones. Additionally, “the apparatus of electracy impacts all areas of our lives – not just when we turn on our computers or mobile devices – and is creating the need to invent new practices for living in an electrate world” (Arroyo 5). Our media exposure is 24/7, and not in A Clockwork Orange sort of way; rather, our electrate world is in constant state of flux and it asks us to consistently adapt to those fluctuating circumstances. In turn, this video experiment (featuring a soundtrack by sound artist Matthew M. Altamura) comprises part of my own invention process in attempts to answer some of the questions above and to unravel nuances, if any, that are revealed within my image archive. Processing 3000 images at once, challenged me to take a closer look at how I have engaged with the apparatus and how I chose to communicate aspects of my identity. While spoken conversations are ephemeral, countless technologies and techniques have been developed to capture moments and make them persistent. The introduction of writing allowed people to create records of events and photography provided a tool for capturing a fleeting moment. Yet, as Walter Ong (2002) has argued, the introduction of literacy did more than provide a record; it transformed how people thought and communicated. Furthermore, as Walter Benjamin (1969) has argued, what is captured by photography has a different essence than the experienced moment. Both writing and photography provide persistence, but they also transform the acts they are capturing (7). boyd’s argument extends beyond the ways the apparatus, experience, and communication have changed (e.g., a digital photo alters how we physically experience the captured moment); it touches upon a misconception that digital = ephemeral, when the opposite is true. Part of the reason why it can be problematic to take, share, and store a high volume of data, visual or otherwise, is the persistence of such data. We can delete data from our phone, the cloud, social media accounts, and even our hard drive, but doing so is a rather futile effort. Hence, the importance of being selective in what we choose to photograph and how often, for which reasons, and where we choose to share and store those images. But before we can be selective, we need to have an understanding of our photographic footprint. Unsurprisingly, people take a remarkably large number of photos, mostly using their smart phones and with the immediate intent of sharing those images online. 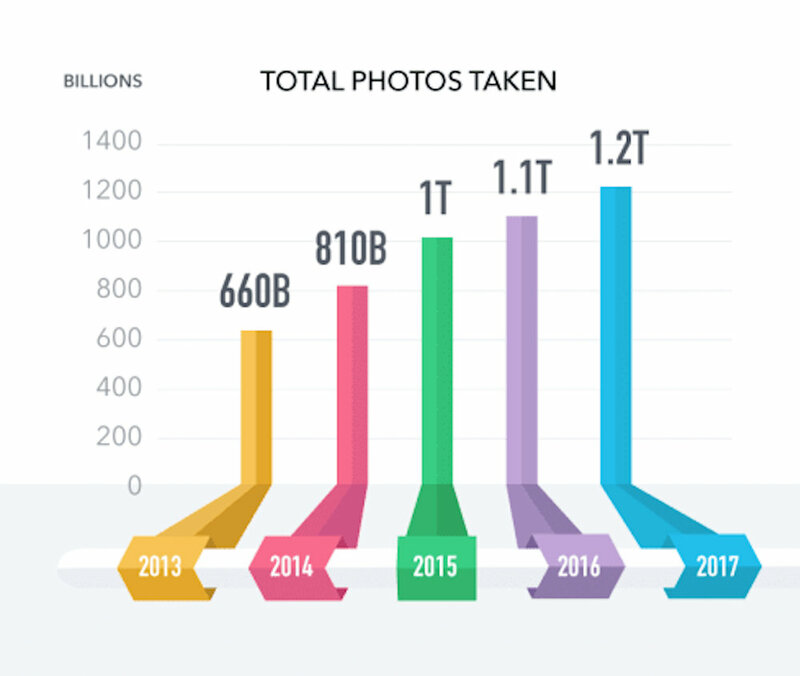 It is estimated that around 1.2 trillion photos will be taken worldwide in 2017 alone, which is an increase of one billion from 2016. Fascinatingly, that number is a conservative estimate, considering a trillion images account for about one billion of the world’s population taking three or less photos a day. There are about five billion people with mobile phones, so if we were to assume that four billion individuals had built-in phone cameras and took three photos a day, about 12 billion images would be captured worldwide daily (Perret). *Image from mylio.com, with source data from InfoTrends Worldwide Consumer Photos Captured and Stored, 2013 – 2017. From an academic perspective, there is the desire/need to understand the questions and information presented above; that is, the underlying reasons behind how and why the popularity of digital photography has skyrocketed in just a few years (e.g. the proliferation of smart phones and the ease of social media sharing), as well as identifying why the images are taken in the first place, why and where they are ultimately shared, and even whether or not such images are stored, organized, and subsequently accessed in the future. From an artistic perspective, however, the question centers more around what to do with large sums of visual data and that led me to creatively experiment with my personal image archive.None of the images featured in the video have been edited in any way, but the numerous, albeit brief visual disruptions, as signified by color bars, reflect aspects of my curatorial process. While the video is slightly edited, it remains a true visual representation of two years of my life and also serves to communicate various aspects of my hybrid (physical/digital) identity. First, take a closer look at the image archive to discover what it is telling you. How many images are stored? How many are edited versus unedited? Were most, some, or none of those images taken specifically with the intent of sharing via social media? If the images were shared, who was the audience? Where were they shared? For what reason? Second, think about the image archive in its entirety. If you were to compile the visuals to create a single video, how long do you think it would be? How much curating do you feel you would like/have to do? Would the level/style of editing change depending on the specific audience/outlet for the video? Would you even want, or be comfortable with, sharing the video on social media? Why or why not? These questions are a starting point to help you contextualize yourself within your image archive. Taking a moment to analyze the photos and videos you have taken/stored throughout several days, months, or years, will hopefully provide additional insight into your photographic footprint, as well as some of the reasons behind the ways in which you have visually curated your digital self. As for me, the process has been both insightful and surprising. I began this project around the same time that I decided to embark on an extended digital detox, primarily refraining from social media and text messaging. Since I felt that I was taking and storing far too many photos, I began using my phone camera to only photograph what I deemed to be truly important and without the direct intent of sharing the images online. Before completing the video, I had already altered the ways in which I interact with social media, as well as making more selective photographic choices. And while I continue to maintain a more distant relationship with social media and my digital identity, I have not eradicated those connections, as I strive for a more balanced approach in my interactions with the digital world. Ultimately, I was surprised at how (mostly) pleasant it felt for me to view a video compilation of two years of my life in only eight minutes. The satisfaction in the process likely stems from a few factors, such as reliving good memories and preparing a creative project for publication. There were some unpleasant parts of the curating process, however, mainly those that required me to revisit less-than-happy (and even some narcissistic) moments. Nevertheless, both the positive and negative sides of this creative experiment have produced a thorough, intimate context to the ways I document and interpret the world. I started this experiment without knowing exactly what the results would reveal to me and even so, I structured a visual electronic narrative of my personal life, which is going to be shared exclusively via digital means. Although my methods differ, I do see this experiment as not only contributing to the (re)invention process, it also brings elements of a mystory into the mix. In Ulmer’s words: “To approach knowledge from the side of not knowing what it is, from the side of one who is learning, not from that of one who already knows is a mystory” (Teletheory, 106). While the initial approach to this project had a clearer direction than one proposed when creating a mystory, the process and the results were unexpected. Also, this video experiment encouraged me to make a greater transition into capturing and sharing far fewer images, and this was just step one in the realm of possibilities for creative experimentation. The proliferation of smart technology, along with the ease and speed of producing and sharing images, is both a personal benefit and a detriment, but I believe that engaging in creative experimentation encourages us to become participatory agents, rather than passive consumers. Since the digital apparatus and the processes it informs are in a constant flux, our relationship with the electrate world must also be constantly anchored in (re)inventing ways in which we create and distribute non/visual data. I encourage you to add, delete, change, remix, any or all aspects of this creative project, as a catalyst for further dialogue and exploration. Arroyo, Sarah J. Participatory Composition: Video Culture, Writing, and Electracy. Southern Illinois University Press, 2013. Benjamin, Walter. “The Work of Art in the Age of Mechanical Reproduction.” Film Theory and Criticism: Introductory Readings, Leo Braudy and Marshall Cohen (ed. and preface), Oxford UP, 1999, pp. 731-751.
boyd, danah. “Social Network Sites as Networked Publics: Affordances, Dynamics, and Implications.” A Networked Self: Identity, Community and Culture on Social Network Sites, edited by Zizi Papacharissi, https://www.danah.org/papers/2010/SNSasNetworkedPublics.pdf. Heyman, Stephen. “Photos, Photos Everywhere.” The New York Times, 29 July 2015, https://www.nytimes.com/2015/07/23/arts/international/photos-photos-everywhere.html. Ong, Walter J. Orality and Literacy: The Technologizing of the Word. Routledge, 1988. Perret, Eric. “Here's How Many Digital Photos Will Be Taken in 2017.” True Stories, Mylio. 19 Jan. 2017, https://mylio.com/true-stories/tech-today/how-many-digital-photos-will-be-taken-2017-repost. Rosenberg, Karen. “Everyone’s Lives, in Pictures.” The New York Times. 21 Apr. 2012, https://www.nytimes.com/2012/04/22/sunday-review/everyones-lives-in-pictures-from-instagram.html. Ulmer, Gregory L. Internet Invention: From Literacy to Electracy. Longman, 2003. Ulmer, Gregory L. Teletheory: Grammatology in the Age of Video. Routledge, 1989.